A film about birds of the Pennines taken over a period of 40 years given by well known award winning film maker Gordon Yates. Representing the backbone of England, the Pennines are home to some of Britain’s most spectacular birds. The film takes us on a seasonal journey throughout the whole area to highlight more than seventy of its birds. 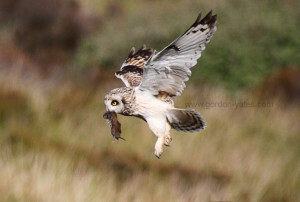 Included in this select group are fourteen species of raptor, including all six species of Owls like the short eared owl pictured. Herons, kingfishers, waxwings and many more are featured. For a taster visit Gordon Yates’ web site www.gordon-yates.com/pennine-birds-dvd/. Gordon says this is his final presentation before retiring so don’t miss it!